Despite groundwater being the main source of water for humans, agriculture and livestock, there is neither a hydrogeological map nor a sound policy for groundwater management and exploration in Somalia. SWALIM undertook a quantitative and updated assessment of the groundwater resources of Somaliland and Puntland and the set-up of a system for groundwater level monitoring. The development of new groundwater sources in Somalia is fraught with challenges. SWALIM has been working closely with the Somali Government Water Authorities and the United Nations WASH Cluster (Water, Sanitation and Hygiene) in developing systems for monitoring water sources in Somalia. Water is Life! 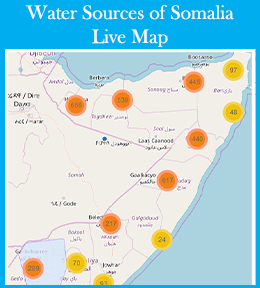 SWALIM project has developed systems for monitoring surface and groundwater in Somalia to support planning, development and sustainable exploitation of the scarce and valuable water resources in the country. SWALIM’s capacity development activities address all three dimensions of the capacity development paradigm, i.e. individuals, organizations and the enabling environment. SWALIM seeks to strengthen these three dimensions together in order to put in place a viable capability for sustainable water and land resource management within Somali institutions. 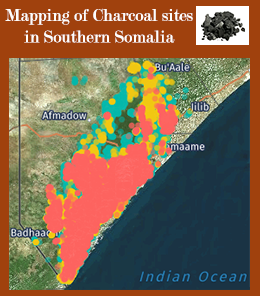 Land resources in Somalia are varied and diverse. 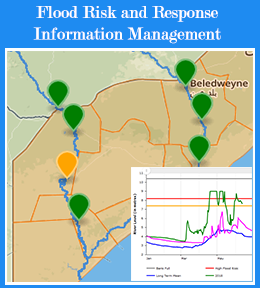 Up-to-date Information about these resources ensures informed decisions on their management and utilization, subsequently guaranteeing they will remain for the welfare of future generations. Remote Sensing is a powerful tool wthat can enable detailed land analysis on a large scale and be used for environmental monitoring at regional and/or country level. Information extracted from satellite images are essential for informed land planning, consistent natural resources assessment, disaster early warning and management, and other tasks. Despite the challenging operating environment, local and international humanitarian partners are reaching more than three million people per month, and are committed to build on achievements from 2017 and continue highly targeted famine prevention efforts in 2018. The 2018 Humanitarian Response Plan (HRP), developed by the Somalia Humanitarian Country Team (HCT) in close consultations with Federal and State authorities, extends famine prevention efforts into 2018. Long and temporally consistent rainfall time series are essential in climate analyses and applications. In Somalia, challenges related to energy access is influenced by both weather and climate extremes and associated conflict. SDI is a well-known concept in Africa, many countries are on the way to having a formal SDI strategy Certain countries, such as Somalia, are starting the process of nation building after years of war. 20 March 2019: The President of Puntland State Hon. Said Abdullahi Deni inaugurated the site and laid a foundation stone for the construction of the Information Management Center (IMC) along with EU representative Mr Martino Vinci and FAO Deputy Country Representative Mr. Etienne Peterschmitt. To improve the value and quality of data from the hydro-metric networks in south and Central Somalia, a total of nine participants drawn from the Ministry of Agriculture of the Federal Republic of Somalia and SWALIM River gauge readers from key monitoring stations along Shabelle Rivers participated in a training aimed to improve the capacity of the gauge readers in carrying out the tasks of collecting, processing and transmitting precipitation, River water level data and other hydro-meteorological information. SWALIM, has completed the analysing and mapping of river breakages along the Shabelle River using very high resolution (sub meter) satellite imagery and a Digital Elevation Model (DEM). Four types of breakages have been identified along Shabelle River namely; Open, Overflow, Potential and Closed. The open breakages are those that were still open during the month of July 2018. Most parts of Somalia will remain dry in the next three days, apart from few areas in Somaliland and a few pockets in Bay and Bakool regions in the south where light rains are expected. Drought conditions persisted in most parts of the country during the first half of April. Pasture and water are in poor conditions and close to depletion in most areas of key pastoral livelihoods across Somalia. 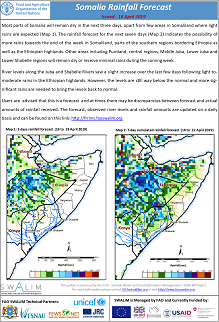 Most parts of Somalia will remain dry for the next three days, apart from few areas in Puntland and Somaliland where light showers are expected. The rains are expected to spread further in space and time in both Puntland and Somaliland as the week progresses.